The area with the gay clubs is Jardins (map). Here you will also find the international flag ship stores, especially on the Rua Oscar Freire and the corner with Rua Augusta. This is the place to shop, to see and to been seen. 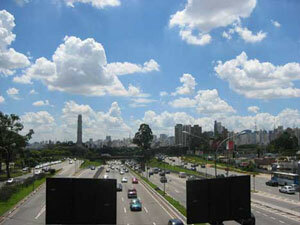 If you're done with your shopping, and is sunny weather, have a walk through the Parque Ibirapuera. It is huge and a nice place to watch the Brazilian boys. 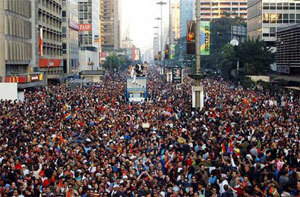 It is said that Sao Paulo has the best gay night life of Brazil. You can find many cool bars and clubs around town. However, the scene is evolving quite swiftly, and venues come and go. Just ask a local what is happening when you're there. But remember, most people do not speak English, which means you need to 'sign language' to communicate. Many bars get going about 01:00 while the clubs start at 03:00 and close about 07:00 when the sun comes up. It's Latin America! In Brazil upon entering a Bar or Club patrons are 100% ID checked and given a paper or plastic drink card. It functions as a tab in all actuality since no cash is exchanged between patron and bartender to prevent theft and/or embezzlement. At the end of your visit patrons must line up to pay entrance fees and associated bar tab at a row of glass enclosed bank teller like cashiers in exchange for an exit receipt stating all charges paid and then exit after surrendering receipt to the bouncer. One must take care not loose the card! More sophisticated bars/ clubs will have a card similar to a hotel key card which is swiped by the bartender upon ordering a drink. The charges are added electronically.